Ensemble Laude Rehearsal. I am star-struck to be here listening to them work out the songs (by Victor Zupanc) to the story I wrote. What a collaboration! 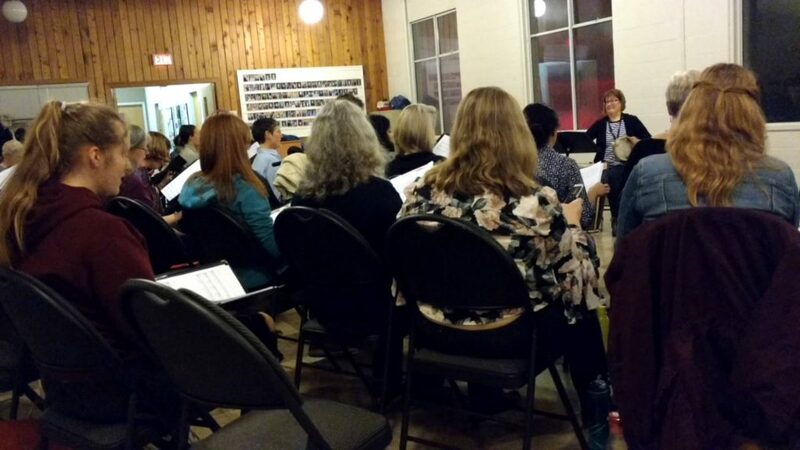 Tonight I sat at the back of a church hall in Victoria, listening to the weekly rehearsal of a 50-voice women’s choir, Ensemble Laude. I’ve heard them in concert many times over the years. Every single time I am inspired and moved to tears by their impeccable and soulful renditions of songs ranging from medieval to contemporary. Tonight I was in awe, star-struck at this galaxy of talent. Even their warm-ups gave me goose-bumps. Had I known all these years that they rehearse every week in this hall, I would have paid good money to drop in and listen. But tonight I was there because they are rehearsing for a musical story I co-created and will perform with them in two months. Their director, the effervescent and brilliant Elizabeth MacIsaac, contacted me last year to ask if I would be interested in creating a story in collaboration with composer Victor Zupanc, and perform it with the choir. I was excited, stunned, and scared. I said yes. The project came at a time when I was restless for variety in my work, which is usually somewhere else, usually for young audiences, and usually solo. I love my “regular” work, but this project was new and challenging. The hardest part, to my surprise, was writing down the story, even once it was clear in my head and I could tell it with ease. I’m simply not used to writing down the stories I perform, and committing this one to the page made me squirmy. But the rewards were great, because once I’d written it down, Victor could do his magic with the music, adding a whole new dimension to the story. The ease of this collaboration was enlightening for someone who’s made a career on the solo side of the stage. 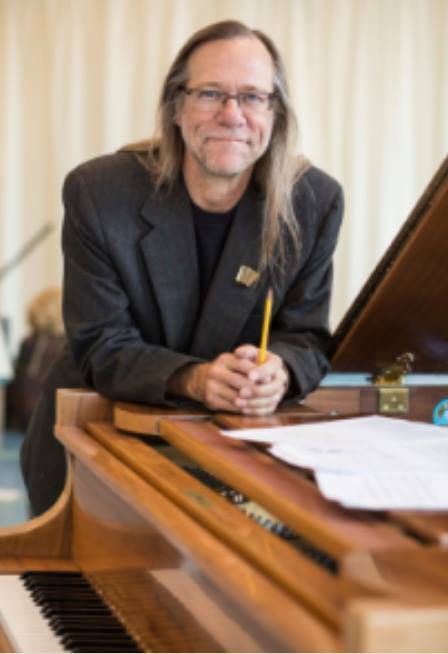 It was exciting to share ideas about how the music could support the story, and I was somewhat surprised that Victor, with all his expertise as musical director of the Minneapolis Children’s Theater, listened to and incorporated my thoughts. Out of all this came The Story of Mahjabin. Based loosely on a group of Sufi wisdom tales, it is about an eccentric old woman learning to play music in an effort to heal the misguided king. Soon I’ll begin rehearsals with the choir. We’ll put the story and the songs together and add yet another dimension: string figures and some mischief with rope. But tonight I was just there to listen. I sat at the back of the hall and this group of smart, skilled, serious, funny and dedicated women stirred me yet again. Because the song they sing when Mahjabin packs up her oude and heads off to confront the king simply reached into the bottom of my heart and tears came up. I can’t wait to put the story and music together. We will perform twice: June 23 in Victoria, June 24 in Duncan BC. Do you have your tickets yet? I hope you don’t miss it. Tickets and details at https://ensemblelaude.org.